Last night was one of those nights in baseball that proves that it is never over until it’s over. 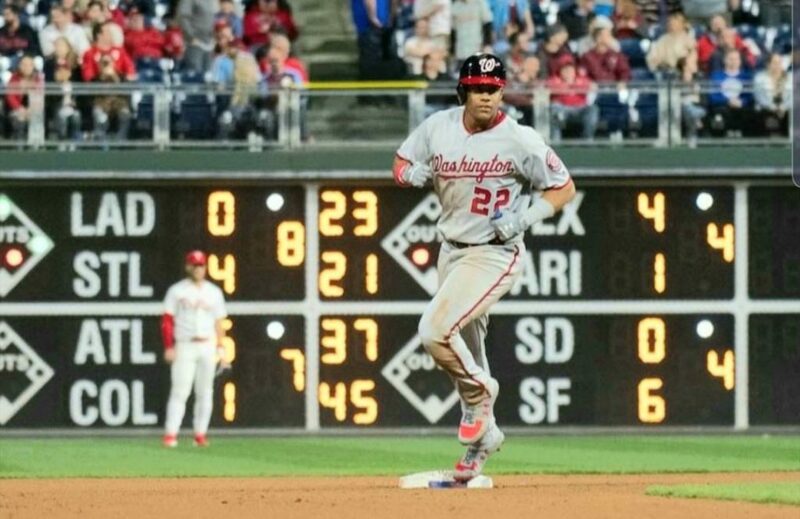 At one point the Nationals were behind by five runs and then they chipped away to a point that they were trailing by one run in the 9th inning with two outs. 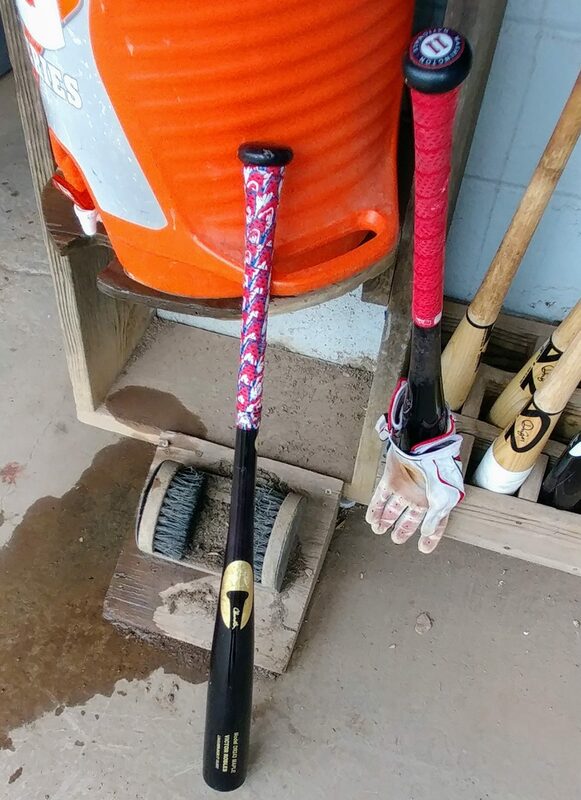 Victor Robles and his team were down to their last strike when the rookie struck gold with his bat emblazoned with the gold “©” produced in Philadelphia (Norristown) by Chandler Bats, and that 32 ounce bat smashed that 5 ¼ ounce Rawlings baseball 394 feet at 102 mph and in turn tied the game at the time to make it possible for the Nats to win it in the 10th inning on a Juan Soto 3-run blast over the rightfield foul pole. Before the game, our in-game article was entitled “Heavyweights on the mound” but it was the Light-Heavyweight (Robles at 190 pounds) and the Heavyweight (Soto at 220 pounds) along with the bullpen arms that were the difference makers. Neither starter, Stephen Strasburg or Aaron Nola factored into the final decision. If the Nats lost that game which looked near-certain by the time Robles entered the batter’s box with 2 outs, they would have fallen to a 4-and-6 record, but the Nats won this “Thrilla in Phila” and got back to 5-and-5 going into today’s game. 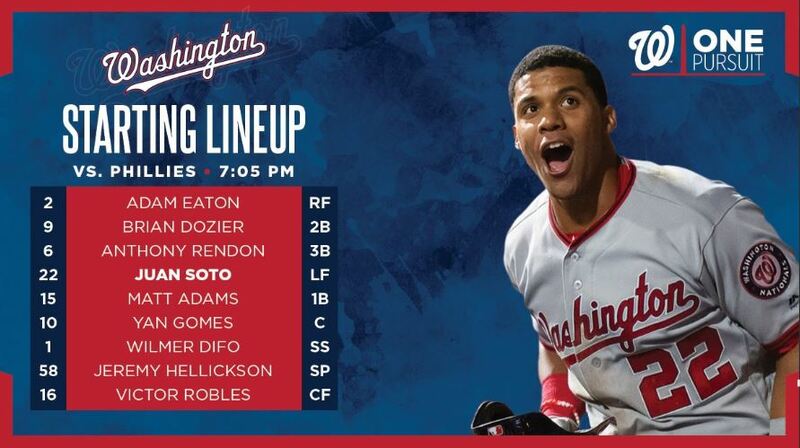 Today’s game is the 2019 starting pitching debut for Jeremy Hellickson, and the home team has Nick Pivetta who is the former Nats farmhand traded in the Jonathan Papelbon deal in 2016. With the day-off tomorrow, we have to wonder how manager Dave Martinez uses his bullpen today with Joe Ross, “Everyday” Matt Grace and Sean Doolittle all most likely not available after pitching in multiple innings last night. The Nats available bullpen pitchers most likely will be Justin Miller, Wander Suero, Tony Sipp, Kyle Barraclough and Trevor Rosenthal. When the score was 6-to-1 yesterday in the 4th inning, how many people thought that Rosenthal would have been inserted for mop-up duty? Instead, the Nats’ manager was not ready to risk further damage, and that allowed the Nats to claw back into the game as Ross and Grace both logged 2 innings each of shutout baseball which continued for 2 additional innings of zeroes allowing the offense to do a rope-a-dope, and with a pitcher’s chance delivered a knockdown from the 21-year-old rookie Robles, and the knockout punch from the 20-year-old Soto.